Ask any home inspector in the south (especially Mobile Alabama) what their most dreaded part of the job is during the summer, I’m sure most of them will say the attic. Why you may ask? Well for one reason it’s usually 120+ degrees up there and almost every time you get up there you find something similar to the picture displayed. Though this seems fine to most people out there it isn’t. When I find something like this I ask myself what was spliced in? Is it overloading the breaker? How many other places has the electrical system been tampered with? Because if you find one improper wired spot you will usually find more. This is a very common thing that I seem to find when doing an attic inspection, especially in older homes. Someone wants additional lighting, a fan, or maybe installing an extra outlet. But what most people don’t realize is the wiring in a home is set up for a certain amount of amperage and voltage. When splicing in additional items it can cause the circuit to be overloaded or over heat the wire causing a fire. Another thing I find is open junction boxes. This usually is caused by someone splicing in a wire and forgets or doesn’t bother replacing the cover. An open junction box is just as dangerous as not having one at all. I have even found wires spliced together without any wire nuts or electrical tape laying down inside the insulation. Improper wiring will come back to haunt you down the road. 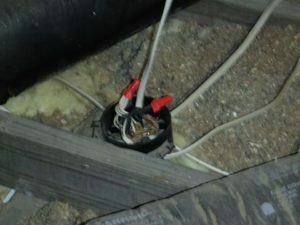 This could occur as a fire, or when selling the home, the home inspector hired by the buyer finds it and you have to pay for an electrician to correct your mistakes. Just remember, If you are considering adding in an extra light, fan, or anything else, consult with an electrician first before you make a mistake that could cost someone’s life. Contact us today for an attic inspection to see what dangers may be lurking in your attic.